George Graham reviews Jacqui McShee's Pentangle's "Passe Avant"
Long-running bands almost always face the dilemma of changing personnel. Sometimes, it gets to the point that there are no original members left, or can go so far as there being different competing groups by the same name composed of various former members of a once-famous band. Sometimes a group can weather personnel shifts almost inaudibly, absorbing the new members, even a lead vocalist, without much change in sound or direction. Other times, the new personnel also brings a new musical flavor to a band, which may or may not sit well with the group's long-time fans. This week, we have an example of a venerable group which has gotten down to only one original member, and in the process changed its sound radically, without very much altering the underlying concept behind their music. 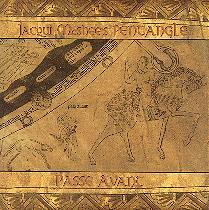 The CD is by The Pentangle, now known as Jacqui McShee's Pentangle, and their CD bears the title Passe Avant, or "go forward." The Pentangle was one of the three principal groups that established the English folk-rock sound that still attracts fans to this day. Probably best-known of the three was Fairport Convention, which was founded by Richard Thompson, and featured as their lead vocalist the late Sandy Denny. The other was Steeleye Span, whose singer was Maddy Prior, and was perhaps the most electric of the three. All three of the groups drew on traditional English and some Celtic folk music, though they also played some original compositions and non-traditional material. All three had distinctive female lead vocalists, ranging from the smoky evocative alto of Sandy Denny to the delicate soprano of the Pentangle's Jacqui McShee. All three groups were formed between 1967 and 1968, and all persist in some form to this day. The Pentangle was perhaps the least-known in this country, though the most eclectic of the three. It consisted of stellar instrumentalists, including guitarists Bert Jansch and John Renbourn, who were known as innovators in defining the so-called folk-baroque style, percussionist Terry Cox, who was as likely to use a glockenspiel as a drumset, and jazz acoustic bassist Danny Thompson, whose career has included both folk groups and stints as the house bassist at Ronnie Scott's famous London jazz club. Though both Jansch and Renbourn did vocals, it was McShee's singing that was the group's most recognizable trademark. The Pentangle broke up around 1973, after a bad experience with record companies, but then regrouped in the late 1980s. Renbourn was the first to depart, then Thompson and Cox, gradually being replaced by other players who would sometimes added a more electric sound to the Pentangle. McShee's vocals and Jansch's distinctive guitar work remained at the core of the group. It has been a few years since the last Pentangle effort, and the group was apparently put on hold. Jansch has released a couple of solo albums, while McShee did a project in 1995 with drummer Gerry Conway who had been a part of the latter-day version of the Pentangle, and keyboard man Spencer Cozins to release an album called About Thyme, which also featured some guest appearances by a saxophonist. That group became the genesis of what is now called Jacqui McShee's Pentangle, since Ms. McShee is the only original member, and more significantly, the sound is miles from the acoustic-guitar dominated arrangements of the earlier Pentangle. In fact, there are long stretches on this album with no guitar at all. The instrumental sound instead is dominated by Cozins' keyboards, including synthesizers, and the very jazzy saxophones of Jerry Underwood. Rounding out the group is bassist Alan Thomson, who occasionally doubles on guitar. There are also some guest appearances by a percussionist and another bassist. While the old Pentangle's music was traditional folk with a little jazz influence, the new lineup is very jazzy while still using some traditional songs, including ones that were the mainstays of the old Pentangle, as starting points. The result will come as quite a shock to long-time fans of the Pentangle -- and I have been one ever since their first album thirty years ago -- but viewed objectively, putting out of one's mind the sound of the classic Pentangle, the result is an interesting and appealing album. Ms. McShee's vocals have diminished little over the years, and the sophisticated, harmonically inventive arrangements of the traditional songs generally work quite well and cast a new light on the material. Once in a while, the group crosses the line and either borders on the New Age, or brings in annoying drum-machine sounds and samples in an apparent attempt to be trendy, but for most part Passe Avant is both creative and tasteful. The material on the album is about half traditional, with several pieces being Pentangle mainstays over the years, but there are four original pieces of varying merit. And to show their connection to jazz, they also included a jazz standard ballad, which turns out to be one of the bigger disappointments. For those who fondly remember the original Pentangle from the late 1960s, Passe Avant by Jacqui McShee's Pentangle will come as something of a considerable surprise. It's an example of a long-running group with only one original member sounding very different from the way they started out. But if one had never previously heard this storied English folk group, with its reliance on the dual acoustic guitars of Renbourn and Jansch, then this new album will seem quite innovative and worthwhile on its own merits. Taking traditional English folk songs into a decidedly jazzy context, with the addition of some synthesizers and eclectic arrangements makes for novel and enjoyable listening. In a sense, it's a considerable extension of the subtle jazz influence of the original Pentangle, but the way it's done on this CD is quite creative. Some of it works better than other parts. Adding trendy drum machine beats and droney new age synthesizer sounds detracts from the otherwise tasteful musicianship of the album. The recording's production and sound are quite good. The spacey reverb-laden mix works well for the sound of this CD, and there's a reasonable dynamic range, though some part of the CD are overly-compressed. The album was produced by Ms. McShee, Cozins and Conway. They and engineer Matt Butler made for a worthwhile listening experience on a good sound system. While Jacqui McShee is still singing some of the same songs she sang in 1968 with the original Pentangle, this is certainly not the same group or the same sound. But overall, it's an outstanding album that even might win over some of the fans of the old Pentangle.